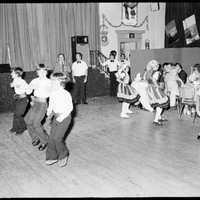 Image of children dancing in Portuguese traditional costumes in a community event held at the First Portuguese Canadian Community Center. Domingos Marques (? ), “Children traditional dance 2,” York University Libraries | Clara Thomas Archives & Special Collections online exhibits, accessed April 25, 2019, http://archives.library.yorku.ca/items/show/2263.